I’ve written a number of posts about WordPress plugins, their place in the overall WordPress economy, and my perspective as it relates to writing and releasing plugins. You offer a version of you product for free. Perhaps it’s a crippled version or it’s a version that’s designed to last for a definitive period of time. You present the user with the opportunity to upgrade the plugin through the use of prompts throughout the plugin (or your mailing list) or however you’re capturing the leads. This will grant all of the features and/or greater access to support, licensing, add-ons, etc. (depending on how your plugin is built) for a one time or even a subscription-based period of time. This model works, but it’s not without it’s challenges. For example, take a look at any of the plugins in the WordPress Plugin Repository and you’re likely to find that many of them have support questions. That is, people who are granted free software are asking for support for it. Then again, what else is to be expected? Inherently, there’s nothing wrong with that and I’m not saying this is wrong. If you’re going to offer something for free, then expect to receive some demand for support. How much you choose to offer varies. Regardless, many plugin authors may be a single person or may be a small number of people all of whom are trying to provide a solid product. And, generally speaking, when you offer a premium version of the plugin, only a small percentage convert. Some people say only 1%-10% convert (though I’ve read reports where somewhere around 3% might be more correct). Regardless, it’s easy to see that going with the freemium model has its defined set of challenges. So say you’re a WordPress plugin author, you’re looking to apply the freemium model to your business or to your product, but you want to make sure that you’re doing so with as much insight and strategy as possible. Some time ago, I stumbled across Freemius for WordPress. It seemed interesting, but over the last year or so, I’ve been focused primarily on contract work so I didn’t see an immediate need for it. Though I didn’t completely dismiss it (after all, I – like many of you – have a list of plugins that I’d love to eventually get around to building and potentially marketing, you know, when I have the time :), I didn’t follow up with it either. Then, a few months ago, the product’s creator, Vova, shot me an email. After that, I opted to revisit the site, read what was provided, go through the video, and really try to grasp what the product was offering. Support For Various Plans. 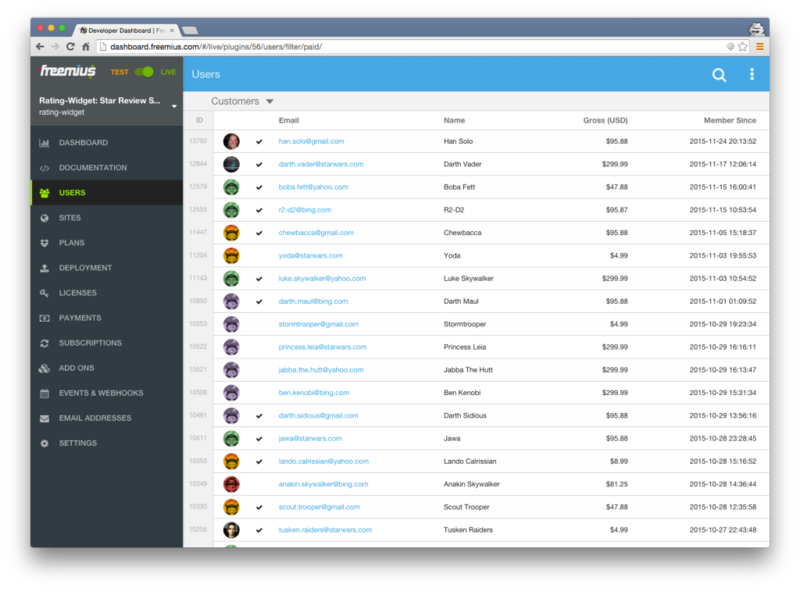 This allows you to easily setup various tiers of service for the premium version of your product. An Integrated SDK. This is included as part of the Freemius service and it allows you to easily incorporate code that will grant access to features based on the tiered level of licensing. Don’t get me wrong, this is really cool. 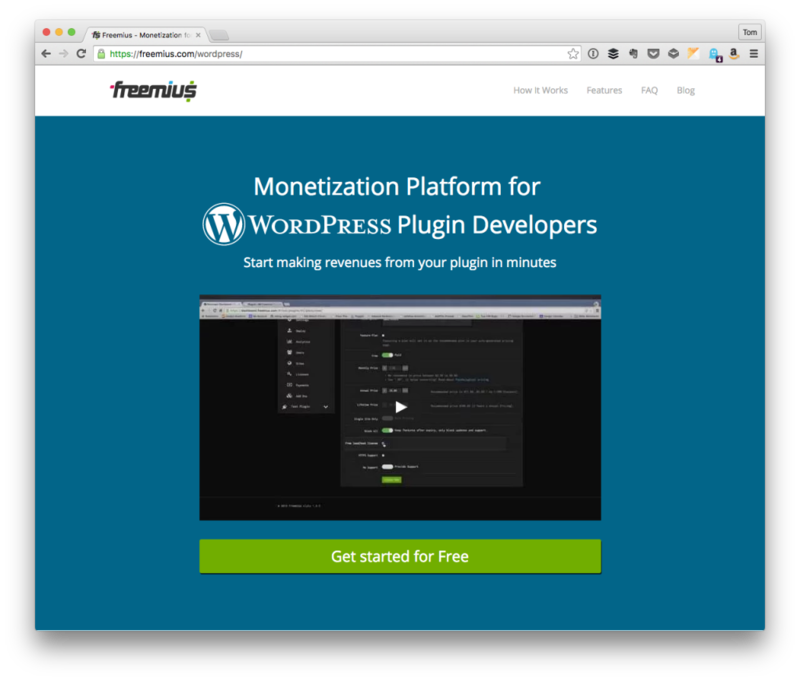 In fact, as far as the SDK is concerned, I haven’t seen anything else like this available to those of us wanting to build out freemium-based WordPress plugins. But there’s so much more to this plugin that I don’t think is covered in enough detail. Sure, you see it on the homepage – things like user analytics, WordPress.org compliance, deployments, support channel, etc. They are all good, but when you browse the homepage, did you take a look at these in deep detail? They aren’t part of the major call outs and they don’t necessarily beg for your attention. A few weeks ago, I hopped on a phone call with Vova to I talk through Freemius. Essentially, I wanted a tour of the product and I wanted to really get to know the ins-and-outs of what he was selling. I felt as if I had a surface level understanding of the service, but I didn’t have a solid grasp on why I would be interested in this from someone who builds plugins at the professional level. Ultimately, our conversation changed all of that. First, Vova is a straight up professional (and very smart) when it comes to this. Sure, he’s a nice guy, fun to chat with, someone that I consider lucky I got to speak with. But on top of that, he’s got a serious heart, drive, and passion for WordPress plugins and for helping others build their business on top of it. 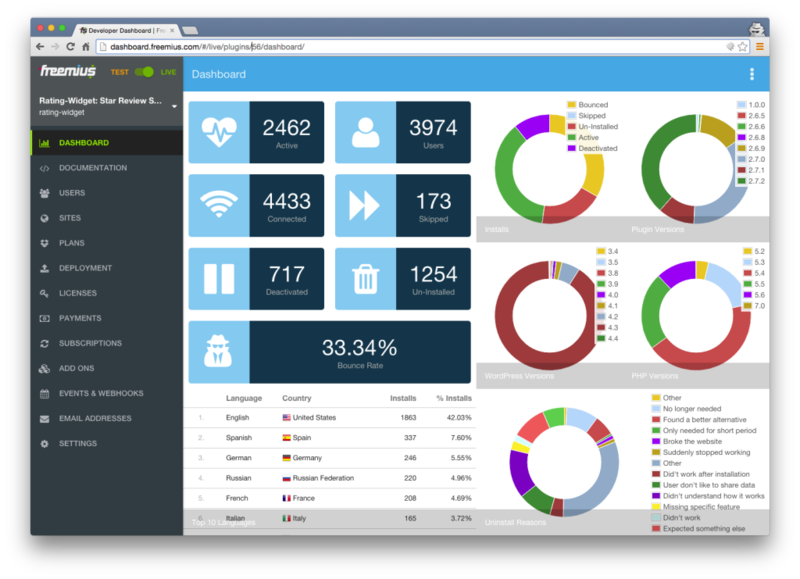 And this is where I got to see some of the highlights of the dashboard of Freemius and why I’m so glad that I did. When a user installs a plugin, you get insight into what the user did. That is, you get a sort of well-dressed event log that shows you when the plugin was activated, deactivated, upgraded, etc. To say that you’re able to track valuable metrics is an understatement. Freemius provides insight as to how many downloads the plugin has had, how many installs it has had, how many activations it has had, and the total volume of sales you’ve made from the premium upgrades. All of this is broken down in a number of charts and displays to make it easy to parse the information. Upgrading the plugin can often be a pain if you don’t have the technical chops to really handle it. And many WordPress users don’t (but why should they?). The burden of making this easy falls on us. And Freemius makes this easy by building the option straight into the WordPress dashboard. Seriously. People never have to upgrade your product without leaving WordPress. For those that have their concerns around the GPL, Freemius plays well and abides by the license and is allows you to offer a free version of your plugin (hence the whole, you know, Freemius aspect). One of the problems that comes with building a premium version of a plugin is that you often have to build a version for free users, then a plugin for premium users. Or maybe you have to hide a lot of the code behind license authentication code (which anyone who can understand conditionals can circumvent this). The Freemius SDK allows you to build the full version of your software and then handle the tiers of service in a way that allows you to cripple certain features. Because of the featureset, I believe that you can successfully market a plugin via the WordPress Plugins Repository and provide upgrades and increase conversions without actually even needing to setup a landing page for your product. This isn’t saying you shouldn’t, but it’s saying that it’s possible. it looks like you expect about 55% of your users to opt-in to your emails (what a fantastic number, right?). There’s even a little more than that, but the features Freemius offers – in my opinion – sound far too good to be true. But seeing it in action changed my perspective about the whole thing. At this point, it’s almost like I’m trying to find the opportunity to actually use the service in one of the projects I’d like to build. Fortunately, there are a handful of other developers who have chimed in on their experience with Freemius. That said, Freemius is also fine for existing plugin authors. For example, Popup Maker runs their store on Easy Digital Downloads and then ended up incorporating Freemius into their product ultimately increasing the benefits of their business and their users all the while continuing to use their existing eCommerce infrastructure. In the past I’ve tried different framework by services to create premium plugins but they are complex, not easy and they require me to follow their rules for writing the code. Freemius allows me to use my prefer workflow and my boilerplate for plugins adding only the code for the initialization and the check of the plans to enable the features. I would recommend anyone building a large WordPress plugin that they intend to build an empire around, even if the core project is free. Getting insight and feedback from users from day one has been huge for us. I’m excited about finding uses for Fremius in my plugins because as a business owner I just need more data than I get from WordPress.org. Distributing a freemium product on WordPress.org is an excellent way to get the free version in front of lots of people — but it doesn’t give you any real tools to help you convert to sales. I’m happy that Fremius is giving us those vital tools. If it were not for successful freemium plugins like WooCommerce, Yoast SEO and Jetpack, our ecosystem wouldn’t be where it is today. The next generation of successful freemium products will emerge from a more crowded market fulfill their users real needs. In order to do that they need user data and advanced marketing tools. I include these not as some type of marketing material, but because the words they’ve offered helped to show real-world, high-profile use of Freemius and what it can do in terms of improving your own experience when building a freemium-based WordPress solution. Is This a Silver Bullet? If you’ve read this blog enough, you know that I don’t subscribe to the whole “silver bullet” mentality. That said, that doesn’t mean that I don’t think this particular service doesn’t come close. Between it’s feature set, the people behind, and the data that it offers, you’d be hard-pressed to find another service offering as much information and as many features in a well-organized, easy-to-use, good looking package. So I’m a fan of Freemius and the team behind it, and I’ll be interested to see more people begin using it (and I’m personally hoping to begin using this in a few projects next year). Nice catch about the automatic upgrades part. Hrm. That is perhaps the most interesting part for us. When we built Postmatic we did so with a commitment to keeping a fully functional free version in the repo. But on the other hand we did not want to force users to download another plugin file and install it if they were on premium. That always feels like a juggling act to me. Do I keep the free version installed? Do I not? How does the premium version get upgraded? Etc. I hate it and always have. I’ll be excited if Freemius can address that pain point for us. What if our repo plugin can be stripped down to something lean and mean, but upgraded users automatically get premium installed for them? Is that true? Could it be for real? If so i’ll be delighted. It will fundamentally change our business model. Hey Jason, first of all, thanks for signing to the demo! 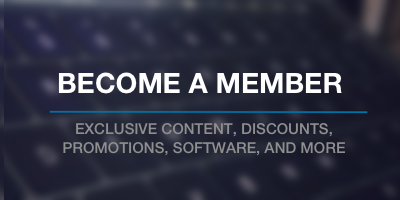 With regards to your question about the upgrade flow from the free code-base to the premium, automated installation is optionable and configurable on our end. BUT, if a developer wants to list the free version on the wp.org repo, it is NOT allowed since installing executable code from outside of the repo is against the guidelines. Once the user already has the premium version installed, updates are handled seamlessly with the WP native updates mechanism. Instead of pulling the version from the .org repo, it pulls the data from our servers. Maybe there is another product here: a plugin manager that solves two problems – Users needing a clear and simple way to upgrade from a free plugin to the premium version… while developers being able to keep premium plugins upgraded. It need a tipping point of developers signing on to use it to really work out…. but if anyone is going to have the list it will be you. Ping me when it’s done, ok? Addressing the first part of your post, I’d have to say I see a lot of freemium plugins gather bad reviews for avoiding transparency regarding their products. I think that openness to any and all potential customers goes a long way in securing a sale. Also, gonna check out Freemius now! Vova did a great job with this one! I have had been using Freemius insights with CF7 Customizer and it is amazing how simple and efficient the insights are. Moreover, Vova is passionate about Freemius, I think almost 90% of the bugs and features I requested in last 6 months were adopted by him. Feedback matters! Thank you Ahmad, appreciate your support and being an early adopter of the platform! I’m in a similar situation where I heard about it before but haven’t had the opportunity to really play with it on a project yet. Thanks for sharing your thoughts from the inside! Of course! Vova and team are doing an excellent job.